This photo has been floating around on facebook recently and I was inspired by it to speak my opinion on this issue. As a photographer that includes a disk of high resolution images with my shoots you can assume that I am on board with a photographer giving their clients the rights to the images. However, my opinions go a little deeper than that. There is a very powerful message in this image. 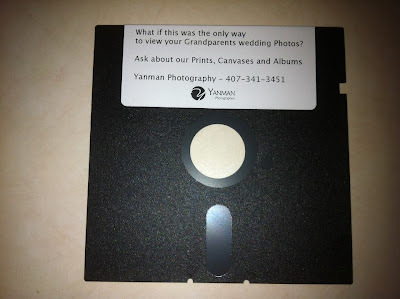 Seriously, what if all of your grandparent's wedding photos were backed up on an outdated technology? Let's go further and apply this to your childhood or to your children's 1st year of life or the most important images of the a loved one who has passed away! What if they were locked away on piece of technology you could no longer get access to or had to pay lots of money to do so? Hiring a photographer is wonderful, and clearly as one, I think you should do it from time to time. But the history of your family, of you, goes much beyond a session with a photographer. So I am going to talk about your images as a whole...the ones I may produce for you as well as the ones you capture every day. YOU NEED TO BACK THEM UP PROPERLY! Okay, I'm not yelling, I promise, but seriously, back those things up! I need to preach this to myself over and over and over again. With every session I have multiple places to back up the original files. Throw in the 1000's of pictures I take of my own family and I am doing a lot of saving and re-saving and organizing images! So what does all this have to do with the way I run my business and what you should do as a purchaser of custom photography??? I believe great photography should be affordable to people. You should be able to document your family's personality beyond the walls of the Sears or JC Penny studio. It is wonderful to be able to do a session with a professional photographer and then get a beautiful album and professionally printed enlargements from your session, but that option is just not affordable to everyone. So then should they just be bound to cheesy mall portrait studios? As a custom photographer I hate that idea! So what is my end of the solution? I give you a disk of your images AND I provide you with a gallery to order prints from. Some people might want beautiful prints and others my not be able to afford them right now. Sure, Costco, Wallmart, Target, etc. certainly don't make my images looks as great as a professional printing studio does, but if you get pictures you love from me instead of settling on your kid sitting next to a giant primary color painted alphabet block at Sears than I am okay with that. But now I have to ask you...do you know your end of the responsibility? I can't tell you how many people I know who have tons of digital images and NO prints. I am not judging, I struggle with keeping current on my prints as well (and even more with framing them and hanging them on my wall). But, if you have the digital files, please consider carving out a chunk of time and saving up a little money to make some real prints. You will never regret it, but I would hate for you to regret not having printed them. As far as technology goes...let's be real for a second. I think we are all savvy enough by now to know that EVERYONE is using digital files for most of their images. I am pretty certain that the makers of computer equipment are not going to do away with tools to read various backup technologies like external hard drives and burned dvds. BUT, those items do corrupt, or get broken or lost. BUT, film negatives got hot or wet and stuck together, or eaten by the dog! So no mater what, through the history of photography, you have had to take care of your data! In the same way one could lose a roll of film one can just as easily lose or delete their image files! I will continue giving a dvd of images and giving you the right to make your own prints because I believe it allows me to reach out to lots of different people. Those who may not have the budget for prints or albums right now, as well as the ones who may have a much larger budget, and also want to have the files of as much of their family history as possible. I will also continue to offer professional printing because the quality is better and I believe you should keep digital files as well as true prints of the images you love most. This works for all those people. If I am going to do this, you have to back up and back up and back up again. In 30 years I hope that your only copies of the images you hire me to take are not stuck on the dvd I mail you. I hope that you will add them to the many images you have documenting your life and move them along with you as technology advances.